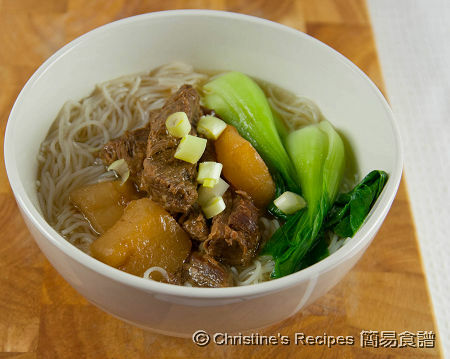 Here comes another popular Hong Kong noodle soup, Beef Brisket Rice Vermicelli Soup. The tender beef brisket goes really well with any noodles soup, including ho fun (aka flat rice noodles 河粉), rice vermicelli or egg noodles. It's perfect served as a light meal. You might have known the wonton soup already. Ever tried this beef brisket noodle soup before? The stewed beef brisket is so tender and goes really well with any noodles, egg noodles or rice vermicelli. As I shared previously, my mother-in-law is an expert in cooking beef brisket stew. I used her tricks to cook the beef brisket beforehand, then pop them in my fridge. 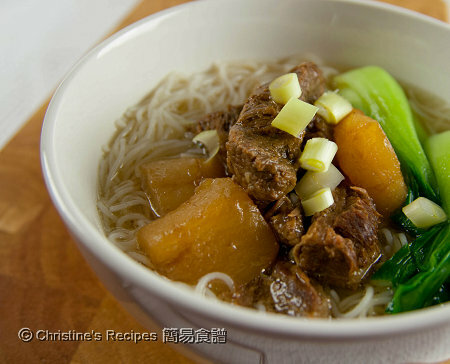 When my lunch time comes, I just need to reheat the beef brisket and add in my rice vermicelli soup. Then a quick and yummy lunch is on my dining table to be enjoyed. Follow the previous recipe and prepare beef brisket stew. Set aside. Blanch dried rice vermicelli in boiling water to wash away the starch and to loosen them up, about 3 minutes. You might like to soak the dried rice vermicelli for a while before cooking, just follow the instructions of the packet. Mine doesn’t need to soak beforehand. Then rinse rice vermicelli with boiling water. Place them in three separate serving bowls. Rinse vegetables. Use a saucepan to cook the stock and water. Bring it to a boil. Add some vegetable oil and Chinese vegetables. When the vegetables are softened. Season with salt, ladle over rice vermicelli. Sprinkle spring onion. Serve hot. When it comes to cook rice noodle soup, I often used Dongguan rice vermicelli because I love my mum’s favourite choice, that goes really well with soup. The texture is pretty smooth. If you’d like to soak the rice vermicelli before cooking, you might use hot water, it would shorten the soaking and cooking time. Just soak until they are soft enough to eat, but still firm. Add them into chicken stock to finish cooking. The timing will depend on how warm or hot your water is - the hotter, the faster the noodles will soften. The key is not to over-soften them while soaking. As always Easy presents a very professional presentation. I just love it. Sooooooooo different. I love this. I order them at restaurants. Now, there's no excuse for making them at home. :D Always a favorite. This is one of the best ever ways to enjoy beef brisket! I think I prefer it with egg noodles. This sounds so delicious. I am bookmarking this soup to try soon! Delicious -- beautiful meal and with so many favorite ingredients! YUMMY! I always order this at restaurants! Looks so delicious! Oooh, nice something to use my leftover brisket for. Oh wow, that looks about perfect, what a great way to kick of the new year with hearty delicious soups. I hope your new year is off to a wonderful start! Would love this any time...very delicious. Would love to cook this for dinner when everyone is at home....so warming too in this cold, freezing weather. This is my favorite kind of lunch. You simply can't beat a combination of vegetables, noodles, hot broth, and leftover meat. Perfect! I use my leftover braised beef brisket for rice vermicelli noodles : ) I have not made it for some time : ) Good dish for winter : ) Happy New Year! A very unique and delicious soup! I would love to try this! Hi I'm a beginner in cooking and was wondering if someone could tell me what the gm stands for in the recipe? Thanks! It stands for "grams". Sorry for the abbreviation. Previously, I just put "g". But my friend told me she took it as 0 because her computer screen is too small. So, I have been using "gm" for the short form of "grams". I can't believe this is this simple. Aside from bok choy, what other vegetables can you suggest? I am looking to cook this soup tomorrow and I thought I need a lot of ingredients. I guess the beef brisket itself has a lot of flavor to make the soup tastes good. The soup is super delicious. Aside from bok choy, you might like to use Choi Sum (菜心), lettuce, chinese cabbage. They go very well with the beef soup. If we can't find beef brisket for the beef brisket stew recipe, what other parts can we use? Beef brisket is the best for making this traditional dish. If no luck, any cheap cut for slow cooking will do.